John A.W. Stephens in Gremlin Theatre’s production of Taking Shakespeare. Photo by Alyssa Kristine Photography. John Murrell’s play Taking Shakespeare is a story about a burnt-out professor and a young man at a transformative time in his life. Gremlin Theatre’s Artistic Director Peter Christian Hansen directs this show with a small but superb cast, elevating this play into a fascinating analysis of both Othello and life. In many ways,Taking Shakespeare seems like a gender-reversed version of Educating Rita that also adds racial diversity to this story. Linda Kelsey plays the professor and John A.W. Stephens plays the young man. Kelsey’s character is an authoritative but tired professor at a small college, from which she is also an alum – she has essentially spent her entire adult life in this small college town in the East. We gleam from references that, as a student, she had a romance with a professor who married someone else. 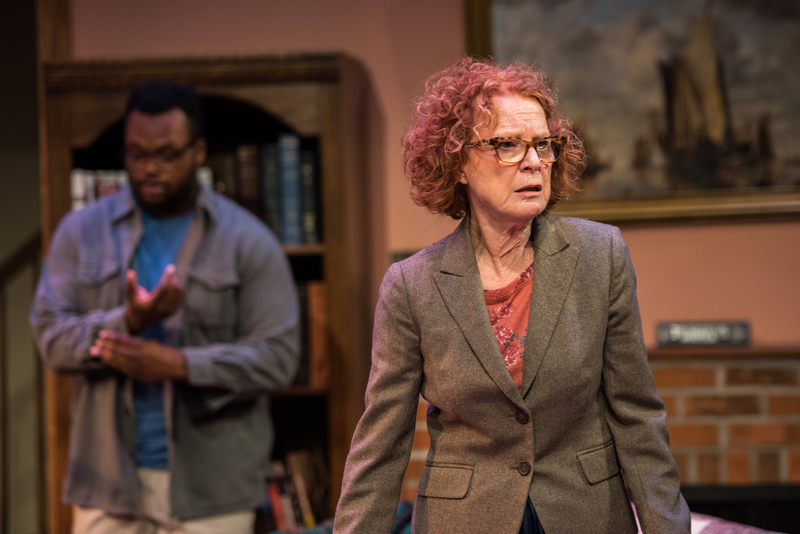 When the play opens, she is a tenured professor, but not at the top of her game. Once an inspiring teacher, she is no longer a popular one; no longer publishes; and abstains from the necessary academia politics. Other than sleep, teach, grade papers, and eat Chinese takeout, she seems to have little in her life. She has been requested to tutor the dean’s son Murph, who started college at the age of 24 and is not “meeting expectations” after taking years off to travel the world. Stephens’ Murph is a charismatic young man whose main focus revolves around video games and his prior travels. The story is told in five weekly meetings between Murph and the professor. Murph does not like Shakespeare because his play titles are “too long.” He does not seem motivated to learn at the initial meeting and the professor declines to take him on as student. Murph pushes back and the two decide to use their time together to study Shakespeare’s play Othello. As the meetings progress, each learns more about the other and a bond emerges. By the end, the professor has succeeded in sparking Murph’s desire to learn, while also being forced to make a bold decision about her own life. The audience not only gets to know each character, but also learns a great deal about the motivations of the characters in Othello and the play’s racial implications. John A.W. Stephens and Linda Kelsey in Gremlin Theatre’s production of Taking Shakespeare. Photo by Alyssa Kristine Photography. Even though the progress of the show is predictable – especially if you previously saw Educating Rita – the interactions between Kelsey and Stephens make the journey worthwhile. As these two very different people grow to respect and care for each other, the audience is drawn in to their conversations. The awkwardness between the two in the first scene disappears as their friendship develops. Kelsey does a first-rate job in her portrayal of a used-up teacher who can fully analyze her plight, but who seems unable or unwilling to do anything to actually help herself. Stephens similarly succeeds in his portrayal of Murph who at first seems a little old to be a student, but eventually settles into the role of someone who knows it is time for his life to enter a new stage but needs help to find his purpose. All of the action occurs in Carl Schoenberg’s set design of the professor’s home – it looks rather like a student apartment, complete with leftover Chinese food. This design subtly reinforces how the professor seems stuck in the past, even to the point of retaining her former lover’s clothes in her closet. A. Emily Heaney’s costume design of the professor’s clothes does an excellent job of using the clothing to show that both characters are stuck: the professor’s older suits are consistent with someone who is stretching the use of previously stylish clothing to avoid spending money on an updated wardrobe, and Murph’s clothing shows that he has not really progressed past his high school days. This production provides the audience the opportunity to spend 90 minutes with two characters at a pivotal time in their life. It is time well spent and also left me with the desire to reread Othello with newfound insight. Taking Shakespeare plays at Gremlin Theatre in St. Paul, MN through June 3.